Deng, J., He, L., and Zhu, A. (2019). "Effect of laminated structure design on physical and mechanical properties of laminated bamboo sliver lumber," BioRes. 14(1), 421-430. Laminated structure design is one of the significant factors that affect the physical and mechanical properties of laminated bamboo sliver lumber (LBSL). Eight patterns of assembly for 5-ply LBSL (LLLLL, LLVLL, LVLVL, LVVVL, LLV’LL, LV’LV’L, LVV’VL, and LV’VV’L) were prepared in this study; L represents one horizontal layer of the bamboo-sliver veneer, V represents the layer that is vertical to L, and V’ represents the layer at an angle of 45 ° to the L (or V). The objective of this study was to investigate the exclusive effect of the laminated structure design on the performance of the LBSL, rather than the multiple effect of the number of plies, chemical components, matter content, etc. The results indicated that the bending modulus of elasticity (MOE), bending modulus of rupture (MOR), impact strength, tensile strength, and compressive strength decreased with the decrease in number of layers of ply, for the following levels of L-ply: 5-L-ply (LLLLL), 4-L-ply (LLVLL, and LLV’LL), 3-L-ply (LVLVL, and LV’LV’L), and 2-L-ply (LVVVL, LVV’VL, and LV’VV’L). For the LBSL with the same number of L layers, those which had more V’ layers possessed better properties, due to the action of the parallel component of the force of the V’ layer. The values of absorption swelling rate, breaking strength, and displacement indicated that the LBSL with higher structural complexity achieved poorer underwater dimensional stability, but better single-bolted connection performance. As one of the strongest and fastest-growing plants, bamboo has received increasing attention as an alternative raw material to wood due to its rapid growth rate (just two to five years per cycle), sustainable utilization (i.e., the bamboo culm can be harvested multiple times from a single planting), high specific strength, and stiffness (two to three times when compared to wood), superior toughness, and surface hardness (Liese 1987; Jiang 2007; Xian et al. 2015). It has been processed into different forms for decades, and corresponding composites have been manufactured as both non-structural and structural material (Chung and Yu 2002; Albermani et al. 2007; Xiao et al. 2009; Deng et al. 2014a, b). Among these bamboo-based products, laminated hot-pressing is one of the most popular manufacturing approaches, regardless of whether the elementary unit is a bamboo strip (Li et al. 2016a) or a bamboo-bundle sheet (Chen et al. 2016a), as Fig. 1 illustrates. Many factors that affect the physical and mechanical properties of laminated bamboo-based products have been discussed, including the sampling location and method, hot-pressing temperature, time and pressure, amount and type of adhesive, size effect, etc. (Li et al. 2013; Sinha et al. 2014; Li et al. 2016b; Deng et al. 2016; Deng and Wang 2018). Chen et al. (2016b) mentioned that the laminated structure design may affect the final properties; however, the patterns of assembly varied with the change in content of the corresponding bamboo-based elementary unit in their studies. But the effect of the laminated structure design has not been analyzed separately. It is important to illuminate the pure effect of laminated structure design on composites’ performance, where variation of chemical components and content do not exist. Bamboo sliver is an elementary unit, processed by a splitting machine, with a smaller thickness than a regular bamboo strip made using a planing machine (Fig. 1). In the present study, eight patterns of assembly for the 5-ply LBSL were manufactured for the investigation of the effect of laminated structure design on the physical and mechanical properties of LBSL. Cross-section images of LBSL were captured and analyzed. The experiments clarified the significance of the laminated structure design on LBSL performance. The work also provided scientific data related to performance prediction and relevant applications. Four-year-old moso bamboo (Phyllostachys pubescens) was grown in Nanchang, Jiangxi Province, China. As Fig. 1 presents, the bamboo tubes with a diameter at breast height of no less than 100 mm were split into several pieces of approximately the same size, and the bamboo nodes were removed. The bamboo slivers were processed into a size of 400 mm (length) × 20 mm (width) × 2 mm (thickness) by a cutting machine along the radial direction. Each bamboo sliver was stored in a 23 °C conditioning chamber until an equilibrium moisture content of 8% to 12% was achieved. Phenol formaldehyde (PF) resin used in the experiment was obtained from Beijing Dynea Chemical Industry Co. Ltd (Beijing, China). The PF resin (with an initial solid content of 47% and pH of 11 to 12) was diluted with water to a solid content of 30% as the adhesive, in which the bamboo slivers were immersed for 10 min and then dried to a moisture content between 8% and 12%. The bamboo slivers were cross-linked by cotton thread in the width direction with no fracture along the length direction, maintaining the original bamboo fiber arrangement. Five layers of bamboo-sliver veneers (BSVs) were assembled one by one, and the LBSL was shaped at a platen temperature of 140 °C, 15 min pressing time, and 4 MPa pressing pressure, with a target density of 0.7 g·cm-1. 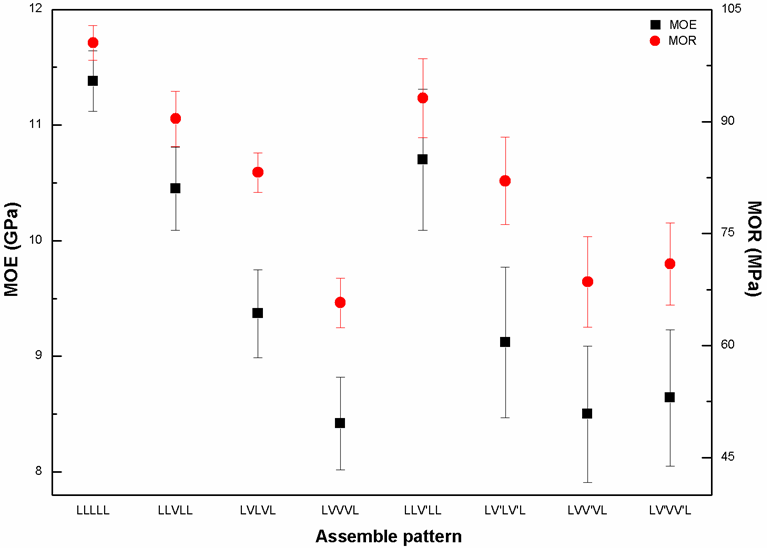 Eight different patterns of assembly for the 5-ply LBSL were investigated in this paper, including LLLLL, LLVLL, LVLVL, LVVVL, LLV’LL, LV’LV’L, LVV’VL, and LV’VV’L (Fig. 2). These boards were stored in a normal room environment, where they were air-dried to a moisture content (MC) of 9.5% to 10.5%. Fig. 2. Eight different patterns of assembly for 5-ply LBSL. Note that L means one layer of BSV, V means the one vertical to L, and V’ means the layer at an angle of 45 ° to L (or V). The value in parenthesis means the structural complexity coefficient (SCC), which is defined as a value to describe the structural complexity of LBSL. The moisture absorption, three-point bending properties, and parallel-to-grain tensile properties tests were conducted in accordance with the Chinese national standard GB/T 17657 (2013). The modulus of elasticity (MOE), modulus of rupture (MOR), and thickness swelling rate after 2, 4, 8, 12, 24, 48, and 72 h of underwater immersion were obtained. The specimens for the tensile test were 10 mm wide and 80 mm long, with double curved necking down to 2 mm wide at the center. A longitudinal compression test was performed according to ISO 22157-1 (2004) using a universal testing machine (Instron 5582, Norwood, MA USA). Tension parallel-to-grain connection tests were in accordance with ASTM D5652-95 (2007). The single bolt had a 25.4-mm diameter, and loading rates were applied to achieve failure within 5 to 15 min. Two linear variable differential transducers continuously monitored and averaged displacements on both sides of the connection. Different patterns of assembly for LBSL, with a size of 80 mm (length) by 10 mm (width) by t mm (thickness), were subjected to the impact test by a pendulum impact tester (ZBC 1151-1, Shenzhen Sansi Material Testing Co. LTD, Shenzhen, China), in accordance with ASTM D6110-06 (2010). Besides, cross-section images of LBSL were captured using a scanning electron microscope (SEM; Quanta 2000, FEI Company, Hillsboro, OR, USA). 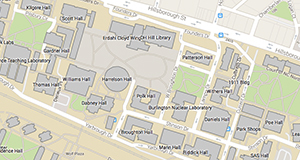 Eight duplicates have been performed for the above-mentioned physical and mechanical tests respectively, and some experimental details are displayed in Table 1. Data were analyzed using a one-way analysis of variance (ANOVA) with the Duncan test using SPSS 18 software (SPSS, Inc., Chicago, IL, USA). Probability values of less than 5% were considered to be significant (p ＜0.05). Graphs were drawn using Origin 8.0 software (OriginLab Corp.; Northampton, MA, USA). 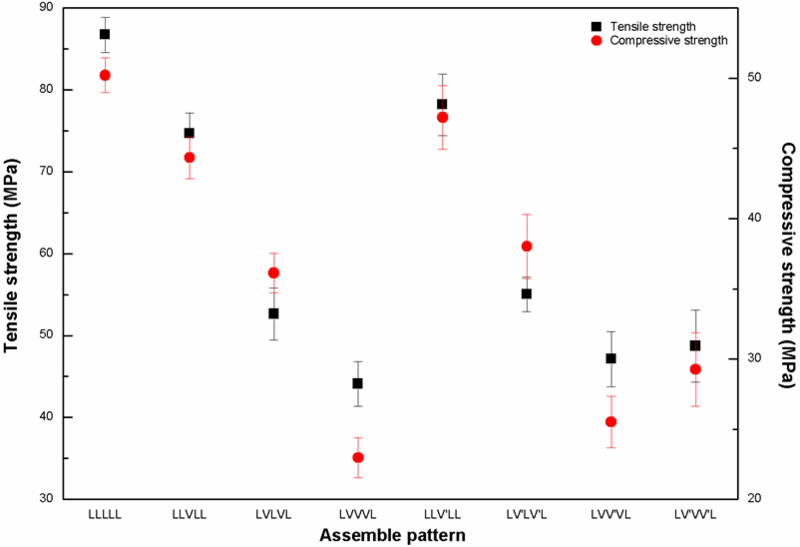 The bending modulus of elasticity (MOE) and bending modulus of rupture (MOR) of eight different patterns of assembly for LBSL are shown in Fig. 3. The LLLLL achieved the highest MOE and MOR, while the lowest for LVVVL, LVV’VL, and LV’VV’L, which indicated that LBSL with more L layers possessed preferable bending properties (provided that loading direction is perpendicular to grain). For the 4-L-ply boards, the LLVLL had a slightly lower MOE and MOR than the LLV’LL, which can be attributed to a zero contribution of the V layer (as the neutral layer) to withstanding the external parallel-to-grain load. For the 3-L-ply ones, there was no obvious difference between LVLVL and LV’LV’L in the bending performance parameters, due to their identical surface layer and neutral layer. V and V’ were not neutral layers for LVLVL and LV’LV’L, respectively, and they exerted little influence. Similarly, no distinct difference could be observed among LVVVL, LVV’VL, and LV’VV’L. A possible explanation for that lack of difference is that these three types of LBSL only possessed two L layers as the main loading units towards the squeeze head, and the other three layers would have little effect on those low MOE and MOR values. The tensile and compressive strength values of LBSL are illustrated in Fig. 4. The LLLLL achieved the highest tensile and compressive strength, which is in line with previous literature that parallel-to-grain tensile and compressive strength were several times larger than perpendicular-to-grain or oblique-to-grain ones (Jiang 2007). The LLLLL had the maximum parallel-to-grain bamboo fibers among these eight types of LBSL, while LVVVL, LVV’VL, and LV’VV’L possessed the minimum. For the 4-L-ply boards, the LLVLL had a slightly lower tensile and compressive strength than LLV’LL, which was likely related to little contribution of V layer to withstanding external parallel-to-grain load. The LVLVL and LV’LV’L had equivalent three L layers; however, the latter achieved a relatively higher tensile and compressive strength, due to the action of parallel component of force of the V’ layer. For the same reason, the tensile and compressive strength values performed as follows: LVVVL < LVV’VL < LV’VV’L. The structural complexity coefficient (SCC) is defined as a value to describe the structural complexity of LBSL, and every commutative adjacent-layer is deemed to increase the value by one. For example, LVLVL has L-V, V-L, L-V, and V-L commutative adjacent-layer in sequence; therefore the SCC of LVLVL is 4, which equals that of LV’LV’L, LVV’VL, and LV’VV’L. As displayed in Table 2, LVLVL, LV’LV’L, LVV’VL, and LV’VV’L possessed the highest breaking strength and displacement, which implied that a larger SCC value led to higher breaking strength and displacement. There was a remarkable difference between the four boards (LVLVL, LV’LV’L, LVV’VL, and LV’VV’L) and other three (LLVLL, LVVVL, and LLV’LL), which had a SCC of 2. The LLLLL had the poorest connection performance, due to its simplest structure (SCC = 0). It can be concluded that LBSL with higher structural complexity achieved better connection properties. Failures in bamboo structures often occur at the connections. Bolted connections often fail by a shear plug or a splitting beneath the bolt caused by tension perpendicular-to-grain stresses as the bolt wedges its way through the bamboo (Windorski et al. 1998). In this study, the LBSL with a SCC of 4 (LVLVL, LV’LV’L, LVV’VL, and LV’VV’L), were subject to tensile failure by bolts. For those with a SCC of 2 (LLVLL, LVVVL, and LLV’LL), it got involved with not only tensile failure by bolts, but also damage of cohesive glue layer. For the simplest structure, LLLLL was just split off throughout. 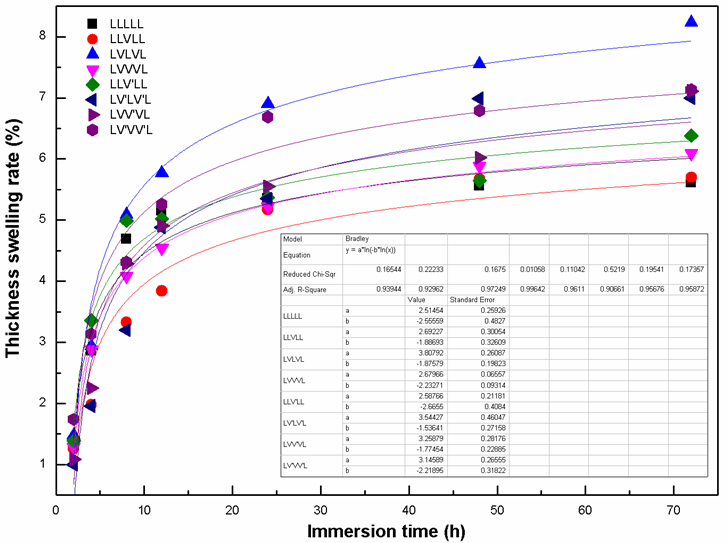 Table 3 shows that LLLLL achieved the highest impact strength, while the lowest values were for LVVVL, LVV’VL, and LV’VV’L, which indicated that LBSL with more L layers possessed preferable anti-impact performance (provided that loading direction is perpendicular to grain). For 4-L-ply boards, the LLVLL had a slight lower impact strength than LLV’LL, which should be attributed to little contribution of the V layer when withstanding external parallel-to-grain impact load. The LVLVL and LV’LV’L both had three L layers, and the latter achieved a relatively higher impact strength, due to the action of 45°- mechanical load bearing component of V’ bamboo fiber (the 45°- component accorded with the direction of L layer). For the same reason, the impact strength value performed as follows: LVVVL < LVV’VL < LV’VV’L. The impact fracture mode differed as the patterns of assembly varied. The LLLLL (SCC = 0) and LLVLL (SCC = 2) experienced fibrous longitudinal tensile fracture, while LVV’VL (SCC = 4) and LV’VV’L (SCC = 4) bore fibrous tensile fracture and stripping. For the other two boards (SCC = 4), LVLVL and LV’ LV’ L were subject to inboard fibrous longitudinal tensile fracture. The LVVVL (SCC = 2) bore inboard fibrous transverse stripping, due to its internal three V layers. Fibrous longitudinal and diagonal tensile fracture occurred towards LLV’LL, which possessed dual characteristics of 90° (L) and 45° (V’4) bamboo fiber. In the initial period, board thickness increased relatively rapidly. During continued immersion, the thickness swelling rate leveled off. Water absorption swelling of LBSL (especially LLLLL) was larger than that of the bamboo-bundle laminated veneer lumber (BLVL) described in other literature (Deng et al. 2016). BLVL’s elementary unit bamboo-bundle was obtained by brooming, which provided more adhesive adsorption sites, as well as more room for mutual insertion of bamboo fibers. Therefore, BLVL was compacted to a greater extent, and better hygroscopic stability was obtained, compared with LLLLL. where y is thickness swelling rate (%), a and b are two constant value in the equation, and x is immersion time (h). The value of a reflects water absorption behavior to some extent. In Eq. 1, parameter “a” is like a “slope” parameter k, which usually appears in a linear equation, showing the curvilinear trend. Therefore, the lower the value of parameter “a” in Eq. 1, the slower rising tendency of thickness swelling rate, further the higher the underwater dimensional stability. The LBSL with a SCC of 4 (LVLVL, LV’LV’L, LVV’VL, and LV’VV’L) had a higher a value than that with a SCC of 2 (LLVLL, LVVVL, and LLV’LL) and then LLLLL (SCC = 0), which indicated that the LBSL with higher structural complexity achieved poor underwater dimensional stability. Cross-sectional images of LBSL captured by SEM show that the bonding layer appeared jagged (seen as enclosed section by the red ellipse in Fig. 6), which indicated that the gluability was not bad. Many holes remained after hot-pressing. The holes were micro-scale and distributed densely near the bonding layer (seen as enclosed section by yellow ellipse in Fig. 6), while relatively large and sparsely separated from the adhesion layer (seen as enclosed section by blue ellipse in Fig. 6). These holes also acted as one of the factors responsible for water absorption of LBSL. The laminated bamboo sliver lumber (LBSL) with more L layers possessed preferable bending, impact, and parallel-to-grain tensile and compressive performance. The LVLVL and LV’LV’L had equivalent three L layers; however, the latter achieved better properties as mentioned above, due to the action of the parallel component of force of the V’ layer. For the same reason, the values of these four mechanical properties exhibited as LVVVL < LVV’VL < LV’VV’L. Structural complexity coefficient (SCC) is defined to describe the structural complexity of LBSL. A higher SCC value led to higher breaking strength and displacement, which implied that the LBSL with higher structural complexity achieved better single-bolted connection properties. The LBSL with higher structural complexity had poorer dimensional stability. The authors gratefully acknowledge financial support from East China Jiaotong University’s basic funding for scientific research (364) and the Jiangxi Education Department’s Science and Technology Research Project (GJJ170406). The constructive comments from the anonymous reviewers are also greatly appreciated. ASTM D5652-95 (2007). “Standard test methods for bolted connections in wood and wood based products,” American Society of Testing and Materials, Philadelphia, PA.
ASTM D 6110-06 (2010). “Standard test method for determining the charpy impact resistance of notched specimens of plastics”. GB/T 17657-2013 (2013). “Test methods of evaluating the properties of wood-based panels and surface decorated wood-based panels,” Chinese Technical Committee for Wood Standardization, Beijing, China. ISO 22157-1:2004(E) (2004). “Bamboo – Determination of physical and mechanical properties: Part 1: Requirements,” International Organization for Standardization, Geneva, Switzerland. Jiang, Z. (2007). Bamboo and Rattan in the World, China Forestry Publishing House, Beijing, China. Windorski, D., Soltis, L., and Ross, R. (1998). Feasibility of Fiberglass-reinforced Bolted Wood Connections (Research Paper FPL-RP-562), U. S. Department of Agriculture, Forest Products Laboratory, Madison, WI. Article submitted: August 16, 2018; Peer review completed: November 5, 2018; Revised version received: November 6, 2018; Accepted: November 7, 2018; Published: November 26, 2018.